Looking for somewhere to keep your boat? Whether it’s because winter is coming around or because you simply won’t be able to take it out for months on end, you’ll probably want to take your beloved watercraft out of the water. But the question is: where will you put it? Keeping your boat at the marina can be convenient, but is often prohibitively expensive. However, taking the boat home will require effort, take up space on your property, and leave it exposed to the elements. Waterworld is here to help. 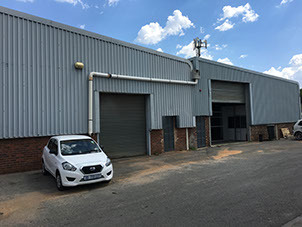 Storage units differ in size and will meet your requirements. Secure lock up on site, along with all our other boats and yachts. Even though we can help keep your boat clean and secure, routine maintenance and winterization (for longer periods of storage) are necessary to ensure your boat will run smoothly when it's time to hit the water again. Basic maintenance won’t require any major mechanical aptitude. Top off your gas tank and consider using a fuel stabilizer if you’re putting the boat away for a longer period of time. Next, change the oil and remove any batteries powering electrical equipment inside the boat. You might want to remove the boat’s battery itself as well, particularly if you won’t be using it for a long time. If the boat requires any repairs, let us know before you put it away in storage. Damages, even small ones like cracks and dings, can fester or worsen over the winter. It’s best to take care of them immediately if you’d like to keep your repair bill low. 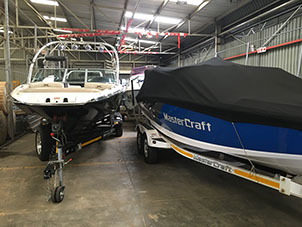 Whether you're storing inside or outside, the most important item required for boat storage is a cover. Invest in a cover specifically designed to fit your boat. This ensures that there are no low areas to collect moisture, but leaves enough room for air to circulate, preventing mildew. Clean your boat, making sure to remove any organic material or water from the inside in particular. These things can rot or mold and cause your boat to smell foul or even inflict significant damage. Next, there are a few mechanical preparations you might want to take before putting your boat away into storage. If you are mechanically confident, you may be able to tackle these yourself. If not, it’s best to seek a mechanic’s assistance. Your boat’s engine will be your main focus. Get it up and running, and make sure everything is moving smoothly, tightening up any parts that are loose or wobbly. Then disconnect the fuel line and let it run until it stops. Make sure the propeller shaft is well lubricated—you might want to just go ahead and re-lubricate it anyway. The next step is to flush the system out with the correct flush. Consult the owner’s manual to see which kit is correct for your model. Don’t forget that the cooling system requires flushing as well. Afterwards, make sure to drain the engine of any water. Treat your carburetors and spark plug cylinders with fogging oil. This is fairly straightforward on many boats, as there will be fittings where you can add the fogging oil. This can be trickier for other boats, which require you to remove the carburetor’s cover. To apply fogging oil to your cylinders, remove the spark plugs and spray the cylinders. This is a good time to check if your spark plugs require replacing and to spray electrical connections with a coating of anti-corrosion spray. Clean out the gear case by unhooking the flusher and draining the gear case, then refilling it with lubricant. Check out the steering column and cables, and clean them of any residue, spraying them down with anti-corrosion once they’ve been cleaned. Disconnect the battery from the engine and spray down its terminals with anti-corrosion treatment. To finish up with the motor, return it to its running position and cover it with a canvas or cloth cover. Avoid using plastic, as it will trap moisture inside. You'll be storing your boat on a trailer. 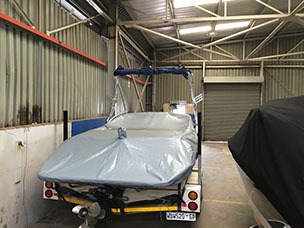 Preparing your boat and your trailer are equally important to get the watercraft ready for storage. To prepare your trailer, check the pressure on all the tires and tighten all the lug nuts on the wheels. Make sure the wiring is in order— your lights should be working to and from the storage facility. If you're storing the boat outside, buy an outboard motor lock to secure and protect this valuable and vulnerable piece. If you're storing for more than a few months outside, cover the tires to protect them from cracking from sun damage. Lastly, chock the wheels of the trailer and use a trailer lock to secure the boat to a large, sturdy object. Note when your boat registration is set to expire. When you and your boat are ready to hit the water, you don't want an expired registration to keep you from having fun. For insurance purposes, take note of any available identification numbers for both your trailer and watercraft. Take pictures of your boat and any other valuable items before storing. If you're storing for more than two months, remove the battery and store it in a cool, dry location. If you're storing for more than six months, use a battery tender (also called a battery maintainer or charger) to make sure the battery will have enough charge to run when you finally take the boat out of storage. Always check your boat's owner's manual for safety rules and complete instructions for boat storage and towing. Boat Grooming / Boat Detailing / Boat Cleaning Specialist Boat Cut & Polish (machine polishing, hand polishing, wax polishing) Antifouling Rust Restoration Stain Removal Stainless Steel polishing Window Polishing Window Nano Treatment Teak Clean and Seal Sign Removal Engine room and bilge cleaning Regular Wash-down Service - removal of all surface dirt like boat scum, bird droppings, light exhaust stains, metalic salts and remove oxidization. Interior Cleaning Leather Protection Vacuum carpets and upholstery Shampoo carpets and upholstery Clean and polish interior windows Clean and polish wooden, laminated, whiteware and plastic surfaces removing dirt and grime Clean inside storage areas Clean & disinfect kitchen area Clean & disinfect bathroom and toilet facilities.